The CrossFit Games app—available on Android and iOS—is back in 2018. Read on to learn which features will return and which new ones have been added. The CrossFit Games app is back in 2018. Read on to learn which features will return and which new ones have been added. As in previous years, the free CrossFit Games app—available on both Android and iOS—will allow you to view Open workouts and submit your scores, but this year it’s easier than ever to track your performance against others in the world, your region and your affiliate. View Open workouts when they’re released and submit your scores. Track your performance against others in the world, your region and your affiliate. Access three personalized leaderboards on your dashboard that instantly show your rank worldwide, in your region and in your affiliate. Push notifications that alert you when each Open workout is released or when it's time to submit your score. A detailed, personalized leaderboard with enhanced statistics, including overall rank and percentiles for your division, region and affiliate. Once the Open begins, tap on any of your personal leaderboards for the world, your region or your affiliate. The card will flip over and you’ll instantly see your overall rank and percentile for each category. You’ll also see your rank, percentile and score for each individual Open workout. The CrossFit Games app makes it easy to submit and track your Open scores and measure yourself against the rest of the world, giving you a complete picture of your strengths and weaknesses. 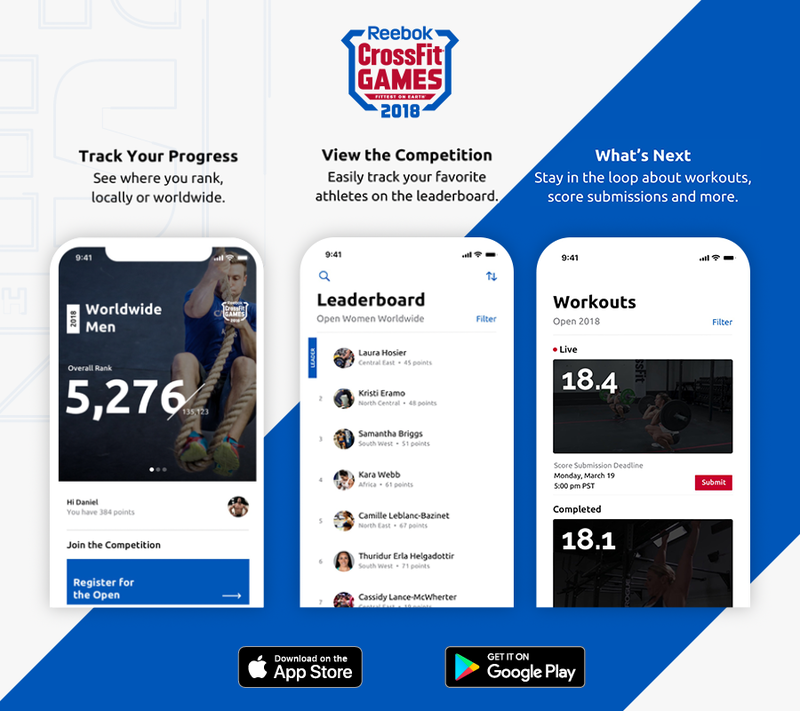 It is the official app of the 2018 Reebok CrossFit Games Open. Register and pay for the Open through the CrossFit Games website (in 2019 you’ll be able to register for the Open right in the app), then download the app, log in and join hundreds of thousands of athletes around the world in competing for five weeks—for fun, fitness, to reach Regionals or even the 2018 Reebok CrossFit Games in Madison, Wisconsin.